Abstract: Industries, governments and consumers increasingly request sustainable resources and greener routes for the integration of advanced functional nanocomposites in products and devices. Among renewable biopolymers, cellulose deserves special consideration since it is the most abundant one. While inorganic nanoparticles add functional properties to a nanocomposite, a flexible and porous cellulosic support will facilitate the interaction of the nanoparticles with the surroundings, their handling and recycling. A significant challenge is to develop high strength, flexible nanobiocomposites controlling the nanoparticle properties, their volume fraction and their topographic distribution within the scaffold. A new concept is presented here for multifunctional laminates where layers consist of bacterial cellulose fibrils decorated by inorganic nanoparticles. Each layer can provide a specific function using a different nanoparticle. As model systems, we have selected two metals (Au, Ag) and two semiconductors (TiO2 and Fe2O3). Energy-efficient microwave-assisted synthetic routes have been used to in situ nucleate and grow the inorganic nanocrystals on the cellulose fibrils. 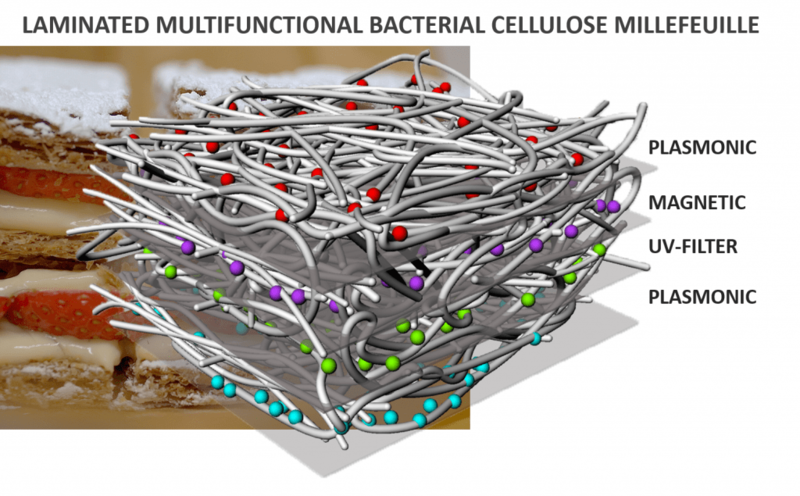 Then, functionalized bacterial cellulose films can be arranged as laminates in a millefeuille construct simply by layering and drying the wet films at 60 °C. After drying, they perform as a single integrated and thicker film. Structural, functional and mechanical integrity of the laminates have been investigated. Molecular dynamics simulations were used to compute the surface adhesion energy between two cellulose fibrils and the results are discussed in light of the experimental peel-off data for the separation of the layers in the laminate.